The Seleka rebel coalition on Saturday afternoon entered the northern suburbs of Bangui, the capital of Central African Republic, Xinhua's staff at the scene reported. South African troops in Bangui for the military training of local soldiers were quickly retreating to the Presidential Palace in the city, where power supply was cut off hours ago. Fierce fighting erupted at night over the control of the city between Seleka rebels and the government forces FACA being backed by South African troops. UN personnel took shelter at a camp set up by an international organization awaiting for the evacuation through the Bangui-Mpoko airport, which was occupied by the presidential guard and South African soldiers, according to a source close to UN evacuees. Meanwhile, France on Saturday announced a plan to send troops to its former colony to ensure the evacuation of its citizens. The entry of the rebels sparked fear among citizens, who prevent their children from going out. "I have told my children to stay at home all time, not to leave the house even in the day time," Jean Bruno Saka, a resident of the Malimake district, told Xinhua. Another resident Pierre Marcel Kamba said," Seleka leaders employ many mercenaries who have records of looting big cities they have taken. We are worried about the same thing here in Bangui." 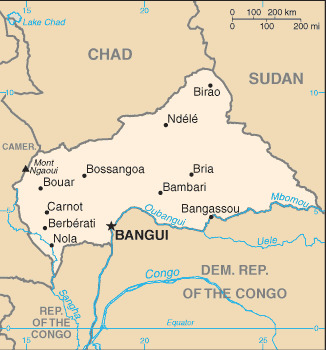 Rebels fought within miles early Saturday after claiming control of Bossangoa and Damara, 75 km from Bangui, to reach the gate of the capital the previous day. Some of them also took a detour through Bossembele to reach Bangui, which borders the Democratic Republic of Congo across a river, according to the military. The rebels claimed to have shot down a helicopter of the army, which on Friday reported a halt of attacks by the enemy because of the air support.